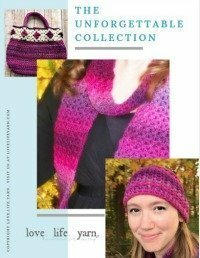 Free Pattern - Stained Glass Medley Hat - love. life. yarn. Winter finally arrived in full force here in Middle Tennessee. We have been hit with a winter storm that closed schools all week! Some nights the temperatures dipped into the single digits and even below zero – which is unheard of for us! My husband was out of town and missed all the winter excitement, which left me to take care of our chickens and ducks. Going out into those temperatures was definitely not fun, but my new hat was a total lifesaver for me! I never felt cold with this chunky hat on. So glad I finished it in time for winter storm Octavia! The Red Heart Medley yarn was wonderful to work with. I love chunky and super bulky yarns because they work up so quickly. The coloring of this yarn is amazing, too. The subtle color changes give these textured stitches some great added interest. I will be using this yarn again! Ch 2 or 3 at beg of row counts as hdc. Round 1: Ch 2, skip 1 st, *sl st into next hdc, 1 hdc into next sl st; rep from * ending sl st into top of turning ch, turn. Repeat round 1 for pattern. Round 1: Ch 1, 8 sc into 2nd ch from hook – 8 sts. Round 2: Ch 1, 2 sc in each st – 16 sts. Round 3: Ch 1, *sc, 2 sc in next st; repeat from * around – 24 sts. Round 4: Ch 1, *2 sc, 2 sc in next st; repeat from * around – 32 sts. Round 5: Ch 1, *3 sc, 2 sc in next st; repeat from * around – 40 sts. Round 6: Ch 1, *4 sc, 2 sc in next st; repeat from * around – 48 sts. Round 7: Ch 1, *5 sc, 2 sc in next st; repeat from * around – 56 sts. Round 8: Ch 1, *6 sc, 2 sc in next st; repeat from * around – 64 sts. Round 1: Ch 2, skip first st, *sl st into next st, 1 hdc into next st; rep from * ending sl st into top of turning ch, turn. Work round 1 of stitch pattern until piece measures 4 ½” from crown shaping. Round 1: Ch 3, dc in each st around, join with sl st – 64 sts. Round 2: Ch 3, *fpdc, bpdc; repeat from * to last st, fpdc, join with sl st.